Deoksugung was originally the residence of Prince Wolsan. It became the temporary residence of the royal family after the Imjin War. The palace is pretty forested with trees and it is especially beautiful during the seasons of spring and autumn. Besides the traditional Korean buidings, there are also some western style buildings such as the National Museum of Art. A western-style fountain was completed in 1937. The western-inspired architectures may be due to King Gojong’s love for the western culture, especially European cakes and coffee. There is also a bronze statue of the Great King Sejong – the creater of Korean alphabets (Hangul). 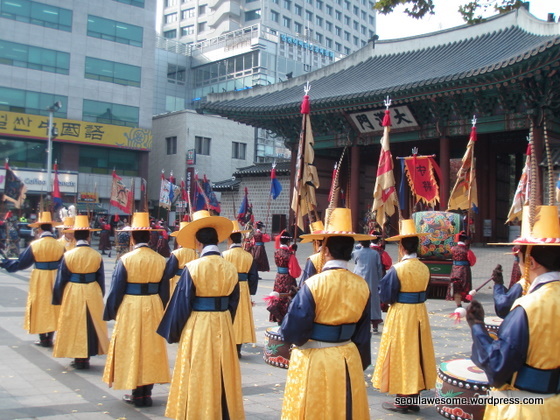 If you reach the palace early, you can even try out traditional royal hanbok and watch the royal guards ceromony. Deoksugung is open everyday (except Monday), from 9a.m – 9 p.m. Admission fee: 1,000 Won (adults), 500 Won (children). 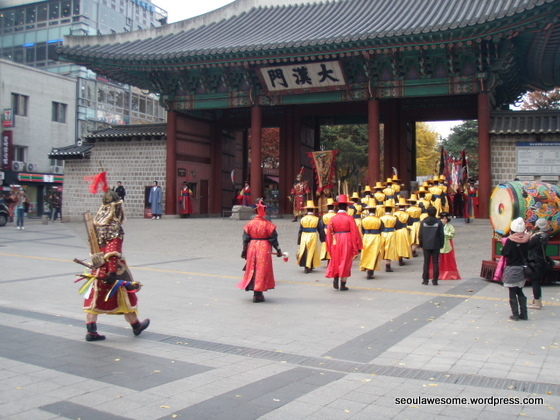 This entry was posted in Korea Travelling, Korean Culture and tagged City Hall Station, deoksoogoong, Deoksugung, korean palace, royal palace, Sejong stature, Sejong the Great, Seoul City Hall Station, seoul palace by seoulawesome. Bookmark the permalink.